Enzo Life Sciences has expanded its portfolio of drug discovery screening platforms with the introduction of the new Leading Light™ Sclerostin-LRP Screening System. The Leading Light™ Sclerostin-LRP Screening System was developed to meet the market need for a simple, sensitive biochemical screening assay for detection of sclerostin inhibitors (antagonists of the Wnt signaling pathway). This kit is an excellent drug discovery tool for detecting small molecule inhibitors that disruption the interaction between SOST and LRP5. Sclerostin serves as a negative regulator of bone formation through its interaction with the LRP5/6 receptor and inhibition of the canonical Wnt signaling pathway. Inhibitors of sclerostin have been shown to increase bone mineral density. Consequently, sclerostin is thought to be a superior therapeutic target for osteoporosis treatment over currently implemented methods such as treatment with bisphosphonate derivatives. 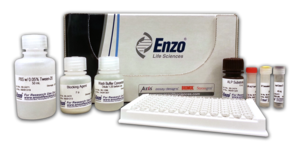 With this first to market complete kit, Enzo Life Sciences enables the screening of sclerostin inhibitors in a high-throughput, reproducible manner without the need for cell lines or transfection. This rapid, chemiluminescent-based binding assay allows for initial screening of sclerostin inhibitors in less than 2.5 hours. The assay contains human sclerostin immobilized to a 96-well plate, and uses an engineered LRP5-alkaline phosphatase (AP) conjugate. LRP5-AP binds immobilized sclerostin, producing signal in the development step. Signal decreases when this interaction is blocked by the presence of a sclerostin inhibitor. This system can be used for drug screening to identify small molecule compounds, antibodies, DNA aptamers and peptides capable of modulating sclerostin-LRP interaction. With the chemiluminescent readout amenable to both 96-well and 384-well plate formats, the kit allows for high-throughput analysis of sclerostin inhibitors. The assay is supplied with an easy-to-follow protocol, a validated acid green 25 inhibitor, and all the necessary media, reagents and controls. The Leading Light™ Sclerostin-LRP Screening System is the most recent addition to the Enzo product line for Wnt research, which also includes the Leading Light ™ Wnt Reporter Assay, the Screen-Well® Wnt Pathway Compound Library, as well as numerous ELISAs, antibodies and proteins providing integrated solutions for Wnt pathway-related research. .